Born in Gainesville, Florida on February 7, 1882, Emma Rochelle Wheeler had gained an interest in medicine at the young age of six after her father had taken her to a white female doctor for an eye problem. Seeing the rare female doctor persuaded young Emma that she could pursue that profession as well. Emma remained friends with the physician who followed her progress through high school and later Cookman Institute in Jacksonville. Rochelle graduated from Cookman in 1899 at the age of 17 and married Joseph R. Howard, a teacher, in 1900. Within a year of their marriage Howard fell ill with typhoid fever and died before seeing his son, Joseph Jr. Soon after her husband’s death, Wheeler moved with her son to Nashville, Tennessee where she would continue to pursue her goal of becoming a physician. Emma Howard attended Walden University in Nashville, graduating from Meharry Medical, Dental, and Pharmaceutical College in 1905. The week of her commencement she married John N. Wheeler, who was also a physician. Together they would have two daughters, Thelma and Bette, and an adopted son George, who was Emma’s nephew. Shortly after the wedding the Wheelers moved to Chattanooga, Tennessee, where for the next ten years, they would practice medicine in an impoverished, segregated black community in the city. Due to the high mortality rate of African Americans in Chattanooga, Emma Wheeler decided to establish a medical facility where the acute and chronically ill could receive care. With her personal savings, Wheeler purchased two lots on the corner of Douglas and Eighth Street and built a three story facility consisting of a nursery, maternity, and surgical ward. Walden Hospital, as the facility would be called, was dedicated on July 30, 1915. The hospital had a 30 bed capacity with nine private rooms and was among fewer than half a dozen black-owned hospitals in the nation at that time.Walden employed two house doctors and three nurses, but 17 physicians from Mountain City Medical Society used the facility to admit their patients. Although her husband was among the doctors who used the facility, Walden Hospital was managed, operated, and funded entirely by Emma Wheeler. It proved so profitable that all of the loans and mortgages which helped establish the facility were paid off in three years. Early in the history of Walden Emma Wheeler performed numerous surgical procedures but soon relinquished that responsibility to other physicians as she concentrated on administrative duties. Wheeler also opened a nursing school at Walden Hospital where she and John Wheeler taught and trained young people to become nurses. In 1925, Emma Wheeler introduced a prepaid hospitalization plan that operated independently of the hospital. The plan, a forerunner of today’s managed care programs, guaranteed for a fee two weeks of free hospitalization, and if needed, post discharge in-home nursing care. With her health failing, Dr. Wheeler retired from her administrative duties at Walden Hospital in June 1953. Walden’s doors permanently closed on June 30, 1953, exactly one month before its thirty-eighth anniversary. 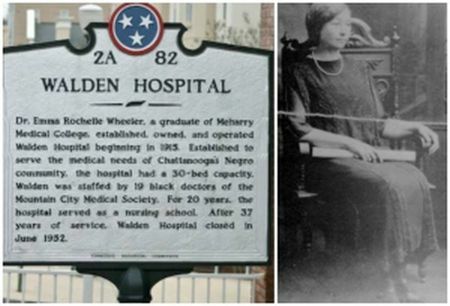 On September 12, 1957, Dr. Emma Rochelle Wheeler died at Hubbard Hospital in Nashville, Tennessee at the age of 75. Five years after her death, Chattanooga’s newest housing project would be named after and dedicated to the memory of Dr. Emma Rochelle Wheeler. Rita Lorraine, "Dr. Wheeler’s Pre-Paid Health Plan," African Americans of Chattanooga; Jessie Carney Smith, "Emma Rochelle Wheeler," in Notable Black American Women: Book II (Detroit: Gale Research, 1996); "Walden Hospital Marker," http://www.hmdb.org/Marker.asp?Marker=13932.